Description of "An Entrepreneur's Diary"
We are living in exciting times (2009). I am not sure if everyone will agree with my description of these times as 'exciting', but I know the entrepreneurs will. This book is for them. I have been an entrepreneur, formally (in the sense of owning my own business) for the past 26 years. I started while I was in a regular full time job and worked at learning and building a management consulting business for 12 years. This book is the result of a lot of questions that I have answered over the years. Today, as I look at the world around me, the landscape of the so-called global meltdown, I see opportunity. I believe that it is entrepreneurship that will solve this crisis. Entrepreneurs who are not afraid. Who refuse to recognize boundaries imposed by others. Who march boldly where others fear to tread. This book is about the 'How' for those who would like to try. This book is about what worked for me. I don't pretend or position what I have written as some sort of 'universal laws of entrepreneurship'. So try them out. Use them if they work for you and forgive me if they don't. What I do know is that in the 26 years that I have been an entrepreneur, to date, I have advised a large number of people using these very same principles and not one of them came back to tell me that they did not work for him/her. I believe the key is to apply them sincerely, flex them to suit your own unique style and persevere towards your goal. Founder of YAWAR BAIG & ASSOCIATES. International Speaker, Author, Life Coach, Corporate Consultant. Yawar specializes in Family Business consulting. He shows business families how to grow, yet stay together, by drawing on his extensive consulting experience with both family businesses and multi-national corporations. Yawar is a life coach and mentor with clients in India, South Africa & Sri Lanka. In 32 years of training and consulting Yawar has taught more than 200,000 managers, administrators, teachers, technologists and clergy on 3 continents. He combines Eastern values with Western systems to transcend cultural boundaries. Yawar speaks five languages. He writes blogs, articles and books focusing on applying learning to create models of excellence in local communities. “I am an MBA not from top B-school…… BUT HOW TO GET PLACED LIKE B-SCHOOL PASSOUT??! 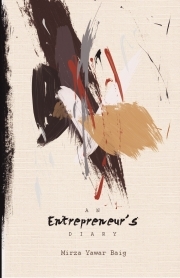 !” by Rumesh Shankar M.
Reviews of "An Entrepreneur's Diary"